"Dexter has been very, very good to me," he says. "I would rather stop doing it than cheapen it." - Jeff Lindsay. via wfaa: Could this be the end for our dear, devious Dexter? Maybe so, says best-selling author Jeff Lindsay. Lindsay won't say exactly what happens to his popular "good-guy" serial killer in his next Dexter book, which is expected to come out next year. But he does say it'll probably be his final Dexter thriller. "It's been sitting with the editor for about two months now," Lindsay says. "I think that'll be the last of Dexter." Lindsay was already a New York Times best-selling author when Showtime launched a TV series based on his books in 2006. And that show catapulted Lindsay to even greater fame. Now that the show is over, though, Lindsay says he wants to concentrate on other things. He's already working on several new projects, including two Hollywood screenplays (he worked in Hollywood for 12 years before striking it big with the Dexter books), a stage play and an idea for another series of novels in the thriller genre. Read the rest of the article after the jump! Besides, he doesn't want to overstay his welcome and write tepid, uninspired sequels like so many authors have done. "Dexter has been very, very good to me," he says. "I would rather stop doing it than cheapen it." Even so, there seem to be plenty of fans still out there. Fort Myers resident Jeff Webb and his wife are such huge fans of the show, they even have rectangular drink coasters shaped like Dexter's blood-stained microscope slides. "He's really kind of a villain," says Webb, 49, about the character Dexter. "With most villains, you're not rooting for them. But with Dexter, you are. You feel his pain. And in his own way, he's doing the right thing." Surprisingly, Lindsay never saw the final season of the TV series. He says he stopped watching after about season four. It wasn't because he didn't like the show. He says he just got too busy with writing and book tours and other engagements. "I don't have much time to sit and watch a lot of TV," he says. "And I can't really binge-watch." The TV series took some deep departures from his books. Lindsay says he accepted them as necessary changes for a TV adaptation, but the two versions of his beloved character are very different. The TV series, for example, humanized Dexter to make him more likable and also jettisoned the concept of Dexter's Dark Passenger — an inner demon that urges Dexter to kill other serial killers and bad guys. 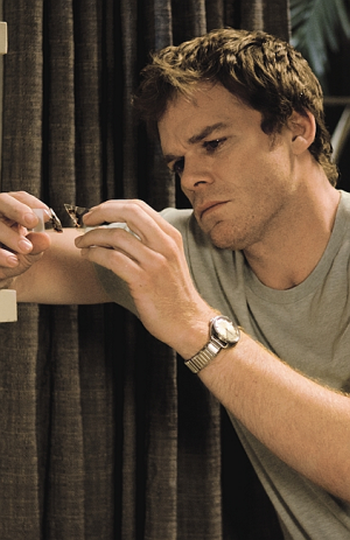 Lindsay's Dexter is an unrepentant psychopath who only pretends to be human. "They can't reform," he says. The longtime Cape Coral, Fla., resident — who wrote a family-themed column for The News-Press in 2001 and 2002 — says his life has changed a lot since Dexter became a household name. He and his family no longer have to worry about where their grocery money comes from, for example. He admits to a few extravagances, too. He's started to collect guitars and now has 25-30 of them (Lindsay still occasionally plays with local funk-rock band Wildfire). And he and his family sometimes take spur-of-the-moment getaways to Key West and other places whenever a big royalty check comes in. They jokingly call them "Millionaire's Weekends." Lindsay has mixed feelings about his books coming to an end. But he says he'll never say never when it comes to more Dexter books. Dexter's popularity has died down some since the TV series ended. But if people clamor for more Dexter, he says he'll likely give it to them. He compares his novel's ending to The Final Problem, the famous Sherlock Holmes story where the detective appears to fall to his death from the top of Reichenbach Falls. But then writer Sir Arthur Conan Doyle brought back Sherlock after public outcry. "I've left a small opening," Lindsay says about the ending. "But if everybody else in the world has moved on, then so will I." Besides, Lindsay says he's looking forward to writing about something else for a change. "Everything ends," he says. "I'm not tired of it yet, but I need to move on."